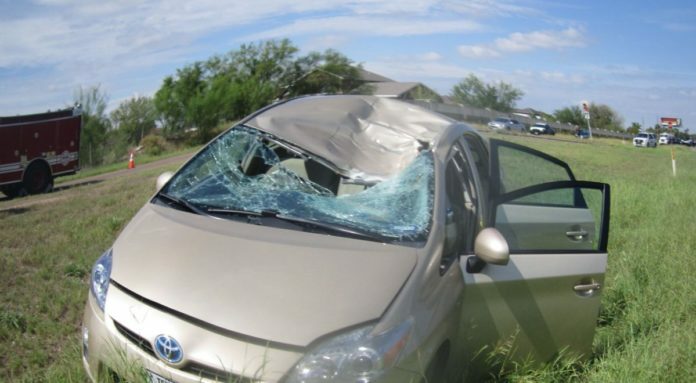 A Toyota Prius was damaged Saturday morning when the wheel and rim came off another vehicle traveling in the opposite direction on State Highway 107. The driver of the vehicle that lost the wheel was killed. EDINBURG — A 78-year-old Santa Rosa man was killed in a mid-morning crash east of Edinburg, according to the Department of Public Safety. Jerry R. Cronin was killed about 10:51 a.m. Saturday, according to a DPS report, when his car was struck by a tire and rim that fell off a vehicle in the opposite lane. Cronin was traveling west on State Highway 107 near Tower Road when the left tire and rim fell off the axle of a Chevrolet Suburban traveling east on the roadway, the report states. The tire and rim struck Cronin’s Toyota Prius on the driver side windshield. The Toyota veered off the roadway where it came to a stop on the grassy center median. Cronin was transported to an area hospital where he later died, the DPS said. The Suburban was occupied by five people, including the driver, who was not identified in the report. No injuries were reported among the Suburban occupants. The DPS says it is further investigating the fatal crash.